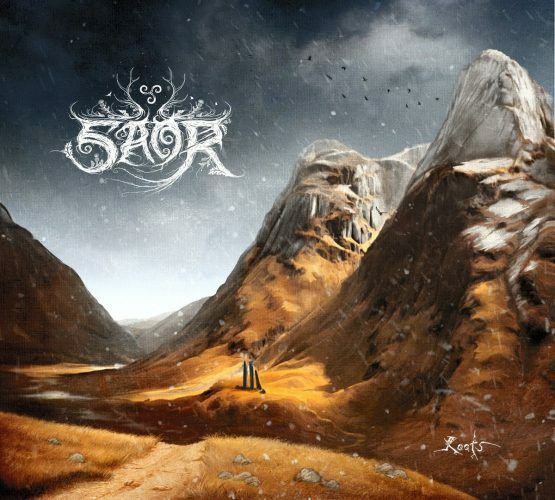 Case in point, Saor (the solo project of one Andy Marshall) is absolutely brimming with passion and primal vitality, and each of the band’s albums (the fourth of which will be released within the next few weeks) marries energy and emotion, atmosphere and artistry, in a way that clearly comes right from the heart. 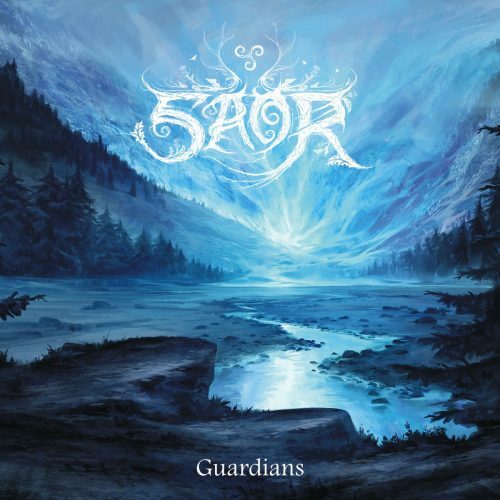 The four tracks which make up the first Saor album (originally released under the Àrsaidh moniker) serve as a near-perfect introduction to Marshall’s epic and eloquent brand of soaringly melodic, folk-infused Black Metal, beginning with the majestic title track, all sixteen and a half minutes of it. Mixing and mingling nuanced acoustics, bristling distortion, sublime melodic leads, and powerful rhythms – not to mention some truly gorgeous touches of violin, flute, and other, similarly esoteric embellishments – the gritty and slightly unpolished nature of the track really lets you feel all the fervor and fortitude involved in its creation, and there’s not a moment of its extensive run-time that fails to grab or keep your attention. 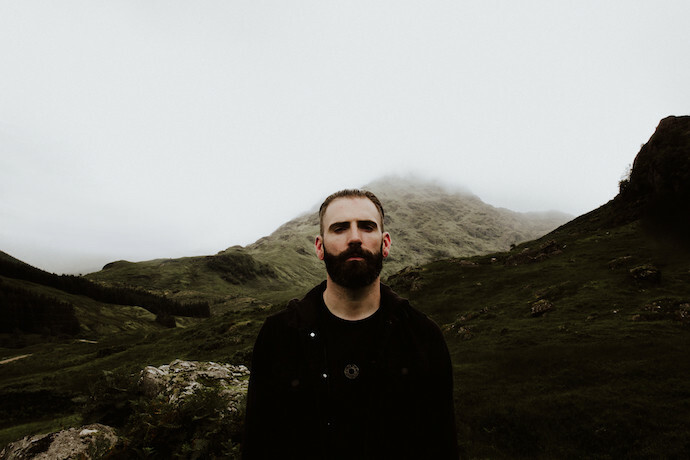 “Carved in Stone” begins with a more melancholy bent than its predecessor, but soon blossoms into a raging storm of electrifying guitars and thunderous vocals, as hypnotic as it is heavy, before climaxing in a blaze of blackened-folk fury. And while the short, sombre interlude of “Saorsa” is more of a mood-setting piece than anything else, the album’s fourth (and final) track, “A Highland Lament”, is easily the best song on the entire record, moving from metallic might to brooding ambience, and back again, over the course of over seventeen stunning minutes. Album number two immediately showcases a clearer, crisper, sound, kicking off with the cinematic scope and sweeping scale of “Children of the Mist”, where grandiose, folk-ish melodies vie for supremacy with an array of wiry metallic guitars and vehement vocals (as well as some well-placed clean-sung chants) for twelve tumultuous minutes, before the achingly atmospheric ambience, gleaming lead melodies, and torrential blastbeats of “Aura” raise the bar even further. The weeping strings and nimble acoustic plucking which open “The Awakening” is perhaps the most traditionally folk-influenced piece of music that Marshall has composed thus far, setting the scene for the subsequent hurricane of whirling drum beats and throat-scarring screams (as well as a truly mesmerising mid-section that resurrects the gloom and glamour of the song’s beginning in a new setting), after which the desolate beauty of “Farewell” segues from rolling rhythms to heart-racing intensity to echoing ambience in just over eight mournful minutes. Concluding with the patient power of “Pillars of the Earth” – a song as soulful, savage, and spellbinding as the majestic Scottish highlands which serve as the band’s primary inspiration – Aura may have its faults (the drum production in particular is a little thin and tinny in places) but these minor flaws only make you appreciate just how elegant, immersive, and ferociously passionate, the music contained herein is. With Guardians Marshall (and his occasional collaborators) clearly stepped up to the big leagues, as not only does this album sound even more massive than either of its predecessors, but the vision and ambition on display is even more epic than before. The opening title-track, for example, is simultaneously the heaviest, most melodic, and most atmospheric song of the band’s career, laying down layer after layer of electric distortion, pounding percussion, and esoteric instrumentation, as the song grows and unfurls. “The Declaration” is, if anything, even more intense than the preceding track, delivering a dramatic deluge of scything guitars, searing tremolo melodies, and bombastic blastbeats that builds towards a truly heroic mid-song transformation into what is easily the most extravagant and uplifting passage of music as yet composed under the Saor name. Its follow-up, “Autumn Rain”, goes for a more atmosphere-focussed approach, Marshall’s portentous growls and enthralling, occasionally doom-tinged, riffs sitting atop a rock-solid foundation of thundering kick-drums and ethereal melodies, after which “Hearth” embraces even more of a slow-burn style, only to finally erupt into a cascade of molten metallic fury, highlighted by moments of brooding clean vocals and soothing ambience. Closing with the shamelessly epic “Tears of a Nation” – whose second half (bagpipes and all) elevates the entire track to even greater heights of harmony-drenched heroism – Guardians may, in the grand scheme of things, be ever so slightly too long for its own good (at fifty-six minutes, the full record represents a pretty significant, occasionally draining, investment of time and energy), but it’s also a brilliantly realised, and incredibly rewarding, piece of work that deserves your full attention and appreciation. For album number four Marshall clearly hasn’t seen any need to alter his signature formula in any significant way – and why should he, as it’s been exceptionally effective so far – but has definitely put in some extra effort towards refining and increasing the intensity, and the creativity, which goes into every element of every song. The title-track, for example, tells a mesmerising story of storming drums, grandiose guitars, solemn acoustic strings, poignant, prog-inflected leads, subtle whispers and gravelly growls… all within its first half… while the second part, or second chapter, goes for an even more sorrowful approach, bringing in twinkling keys and smooth, wordless clean vocals in addition to the usual plethora of blackened fire and blissful folk. “Monadh” is largely built around variants of a single, striking melody line, first as a blend of solemn piano and sombre guitar work, then a mix of pulsing percussion and weeping violin, then a frenetic blast of strafing drums and wild, winding tremolo… all building up to a truly colossal (not to mention cathartic) conclusion that brings all these elements (and more) together. With “Bròn” you can see clearly how these little refinements – a little tightening up here, a little loosening of the reins there – have helped bring Saor’s sound to a new level, as although there’s no single element here that’s a huge revelation (although the graceful female vocals near the end of the track are certainly a welcome surprise), the more focussed songwriting and the more open, more spacious production, combine to make this track a near perfect microcosm of the band’s sound in all its glory. 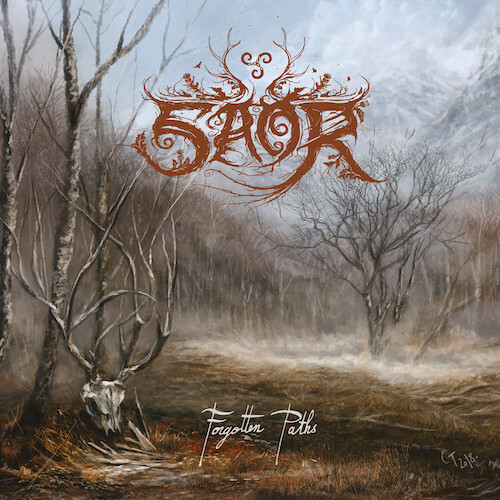 Ending, unexpectedly, with the pure folk instrumental of “Exile”, there’s ample evidence presented here to suggest that Forgotten Paths might just be the best Saor album yet… although you’re going to have to wait a little while longer to be able to judge that for yourselves! 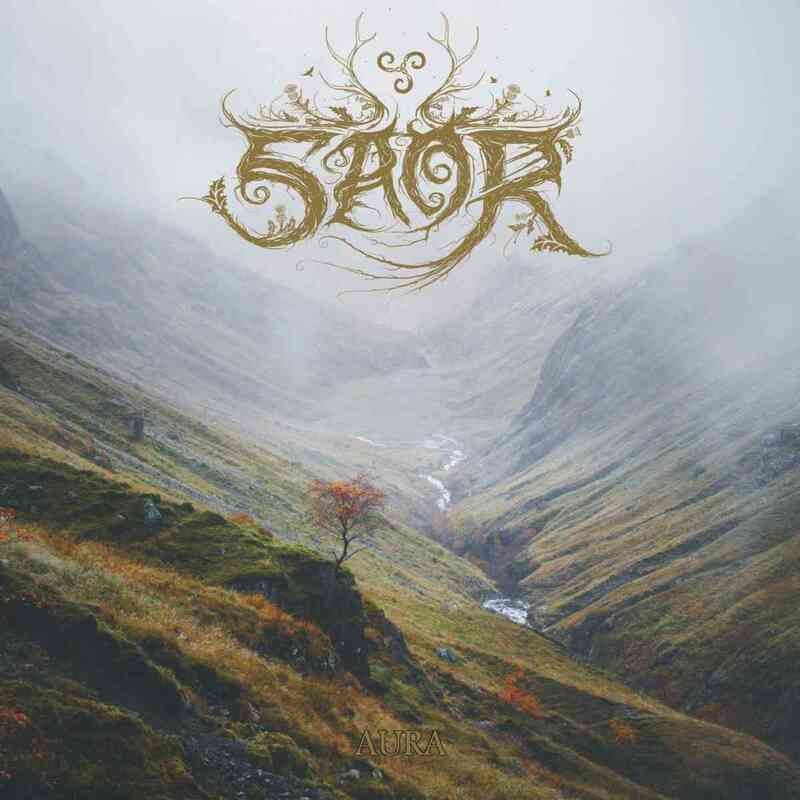 I’m a little bit of a Saor fan, and I agree with your assessments. I also enjoyed his Fuath album. Has Andy ever given any indication he’ll do another one of those?